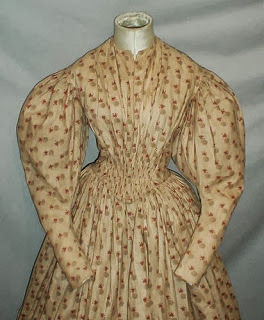 A charming transitional period early1840’s cotton print dress. The dress is all hand stitched. The fabric has a brown circle and red floral pattern on a tan background. 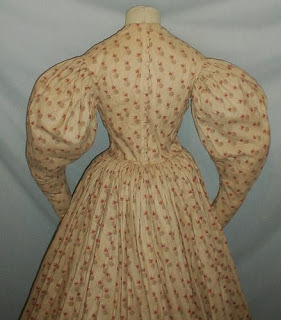 The bodice has Gigot style sleeves that are a hold over from the 1830’s time period. 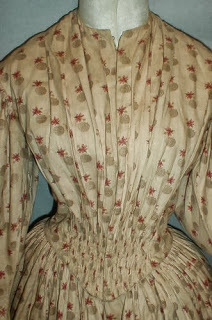 The bodice has a fan pleated front and a ruched front waist. The bodice is lined with homespun linen and has a front hook and eye closure. 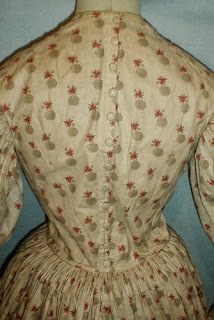 The back of the bodice is decorated with fabric covered decorative buttons. The neck and waist are piped. The skirt is attached to the waist with tight cartridge pleating. The skirt is unlined. The dress is in very good condition. There is some light underarm discoloration. There is one section on the lower back of the skirt that has a few ½ inch to 1 ½ inch splits in the fabric. Some of the hooks and eyes are newer replacements. 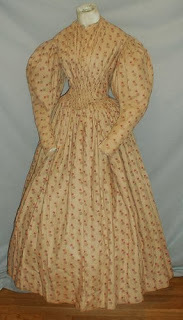 Bust 32 Waist 24 Skirt length 37. It's actually a late 1830's based on those sleeves! 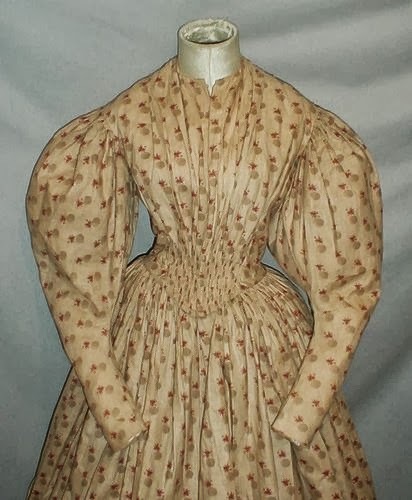 By the time you get to the 1840's, the upper part of the sleeve is reduced to being fitted (either gathered down or just fitted) - and even by 1838, you start to see the "new" sleeve shape. 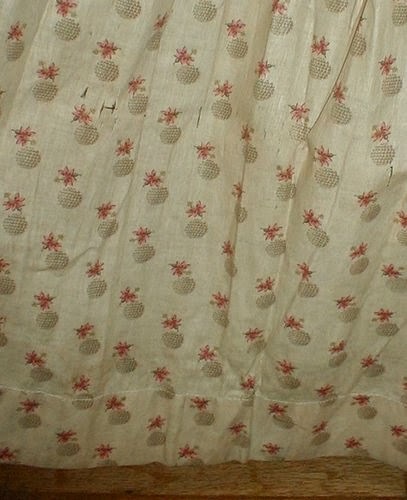 Instead, I think this is from about 1836-1837. The sleeve is still ridiculous at that point but you start to see a point in the waistline stay around longer as well. I love seeing that these could be made closed in the front. I love my 1830s dress but am hog-tied in getting myself into it with the back closure.